Turkey’s prime minister has threatened legal action against a UK newspaper for publishing an open letter criticising his handling of recent protests. 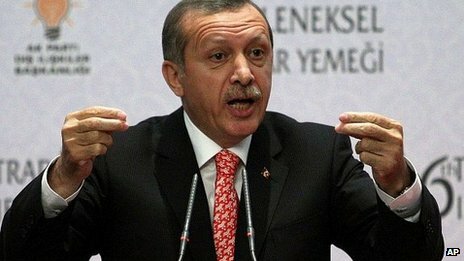 Recep Tayyip Erdogan accused the Times of “renting out its pages for money”. Hollywood celebrities and academics were among those who signed the letter this week accusing Turkey’s government of “dictatorial rule”. 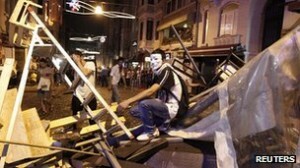 A row over a park in Istanbul last month triggered widespread anti-government protests. At least four people were killed and thousands more injured as police cracked down on demonstrators who accused Mr Erdogan of becoming increasingly authoritarian. “The press wants to throw mud to see if it sticks,” Mr Erdogan told reporters in comments broadcast on Turkey’s NTV channel. Mr Erdogan said those who signed the letter – taken out as an full-page advertisement – had “rented out their thoughts” and did not genuinely support democracy. “If they truly believed in democracy, they couldn’t have displayed such a lack of character to call the leader of a party that won 50% of the vote a dictator,” the prime minister said. The Times has so far not commented on the remarks. They condemned the crackdown on anti-government protesters and compared giant pro-government rallies – organised by Mr Erdogan’s AKP party to counter the protests – to the huge rallies staged in Adolf Hitler’s Nazi Germany. The wave of unrest in Turkey was sparked by demonstrations against controversial plans to redevelop Istanbul’s Gezi Park. The authorities’ heavy-handed response sparked anti-government protests nationwide. This entry was posted in News and tagged anti-government protests, Recep Tayyip Erdogan, Times, Turkey on 26 July 2013 .